Aisha Buhari to APC - Consider card-carrying members for appointments | Welcome to Dare Lasisi's blog! The event, which took place at the Daura Stadium attracted women and youth supporters of the APC from across Katsina state. Mrs. Buhari noted that the constitution of the party specifies that appointments to offices in an APC led government should go to card-carrying members; she, therefore, advised that the party constitution should be respected. One of the speakers at the event, Minister of Aviation, Senator Hadi Sirika praised the electorate for choosing President Buhari, whose integrity, he said, is time-tested. He assured them that the second tenure will result in development in all spheres of endeavor. 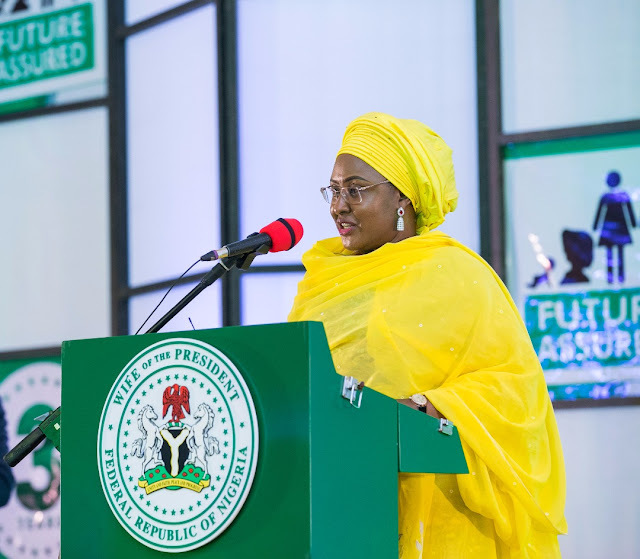 He commended Mrs. Buhari for her initiative of engaging women and youth during the presidential campaign, which resulted in the massive votes recorded. The event was attended by the wife of the Governor of Katsina state, Mrs. Zakiyya Masari, wife of the Deputy Governor, Mrs. Mannir Yakubu and wife of Minister of Interior, Mrs. Hadiza Dambazau.